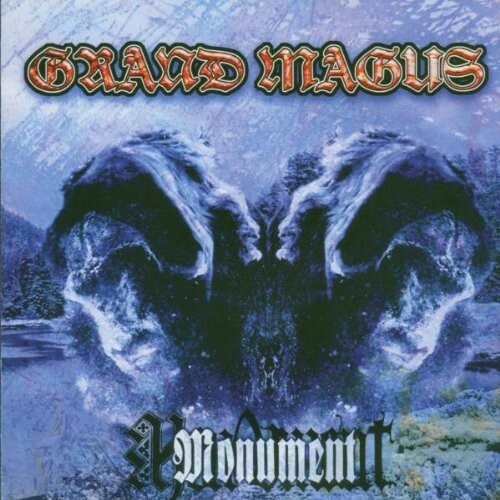 Rock trio Grand Magus did themselves few favors with their solid but unspectacular 2002 debut, which quietly sank into the general morass afflicting the doom/stoner movement at the time. And when guitarist and singer JB subsequently hooked up with Michael Amott's high-flying Spiritual Beggars, it looked as if Grand Magus were doomed (no pun intended) to vanish altogether, leaving only that one middling release to their name. However, thanks to the incredibly gregarious and liberal nature of the Swedish music scene, here they are - unexpectedly back with a 2003 (and now 2015) follow-up that is quite deserving of it's imposing title: Monument. Howling winds and mournful guitar lines introduce album opener "Ulvaskall (Vargr)," which promptly lurches into gear on an Iommi-approved, bent-note riff and fittingly bleak words intoning "I'm damned and I'm cursed forever/Destined to walk this land," over and over again. Ensuing single (yeah right - a "single," ha!) "Summer Solstice" steps it up a notch to take listeners chugging down the highway, and by the time Grand Magus slow it down again for the lysergic roll of "Brotherhood of Sleep" and the gargantuan doom creep of "Baptised in Fire" [sic], retro-metal fans will likely be foaming at the mouth over what they're hearing. Simply put, energetic doom doesn't get much better than this, or, for that matter, the album's frightfully heavy next offering, "Chooser of the Slain (Valfader)," which combines chiming bells, concussive power chords, and lyrics of Viking lore to thrilling and terrifying effect. And to wrap things up on a high note, the likeminded "Food of the Gods" offers a final, concise battering before the colossal denouement of ten-minute epic "Ye Who Seeks... Shall Find."